Antimatter Games, the studio behind Killing Floor and Rising Storm: Vietnam, has revealed it is working on a high player count first-person military shooter named ‘83, that sees players fighting as part of a force of over 40 players against the opposing team. Set in an alternate timeline where the Cold War became volatile in the early eighties, ‘83 sets to offer players a massive battle like those enjoyed in popular battle royale games, but with teamplay offering a return to FPS traditions from the likes of Call of Duty and Battlefield. Antimatter has stated that players will be offered the chance to complete challenges across sprawling maps in every game, which can turn the tide of battle toward their team’s favour by creating “tangible impacts”. If the trailer is anything to go by, this means a lot of explosions that seem powerful enough to wipe out a handful of a team’s members. Players will also have access to a selection of air and land-infantry vehicles to help sway the course of battle, though Antimatter is yet to share just what we’ll be driving furiously around the map. 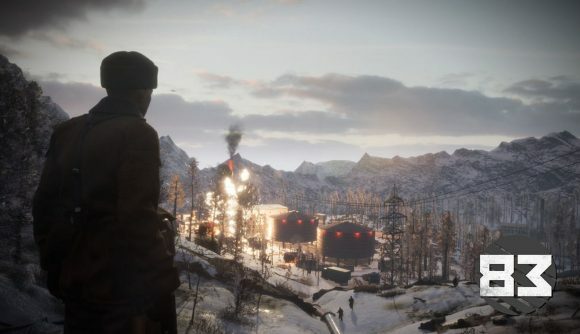 The developers have also stated that realism-driven players will benefit from a huge array of weapons that are true to their real-world counterparts, including an accurate recoil and reload time. When starting each new battle, players will get to choose between two opposing factions; NATO and the Warsaw Pact. Victories in game will accumulate and eventually contribute to the narrative of the game’s story in real-time, in a system that the developers are calling ‘persistent warfare’. Whether faction choice will also affect playstyle and items attained is unknown at this point, but I imagine the game’s focus on realism will mean both armies have their own unique details and advantages. While there’s no formal release day as of yet, what’s been shown of ‘83 looks fun and explosive, and hopefully it won’t be too long until we’re all playing through huge battles in the Cold War.